The Tropicana Macaw is very pretty bird that comes in a rainbow of colors! 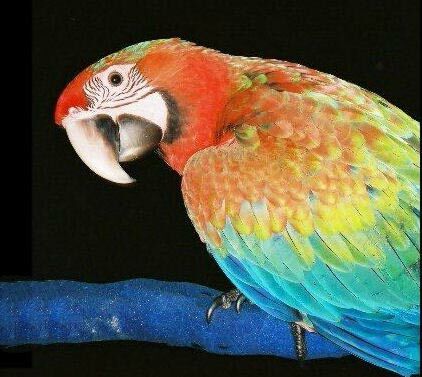 With the Harlequin Macaw (having a Blue and Gold Macaw and a Green-winged Macaw for parents) you have a macaw that is a real beauty and good natured. The Blue and Gold macaw is renowned not only for its beauty and sweet nature, but also its speaking ability. While the other parent, the strikingly handsome 'gentle giant' Green-winged Macaw, lends its beauty and a very gentle, amiable nature. The wonderful attributes of the Harlequin make it a great parent for the Tropicana Macaw. Crossing the vibrant Harlequin Macaw with the fiery Scarlet Macaw brings even more strong reds into the mix. Because of its beauty, the Scarlet Macaw is one of the most highly favored macaws. This sweet though independent tempered bird has been the best known South American parrot for over 100 years. The Tropicana Macaws inherit all the beautiful coloring of their parentage, as well as a composite of their personalities. The behavior and temperament of hybrid macaws are more unpredictable and uncertain than the coloration. The Tropicana Macaws are hybrid parrots that are very attractive with the intelligence and temperaments of their parents. The Tropicana can learn to talk and have an amiable nature, though the Scarlet influence may also introduce a bit of an indomitable spirit. As with all macaws, they will require good socialization and consistent training to make good pets. The Tropicana Macaw is a second generation hybrid macaw. It is a cross between a Harlequin Macaw hybrid and a Scarlet Macaw Ara macao. Tropicana Macaws are a very attractively colored macaw hybrid. Both parents of the Tropicana Macaw contribute to the colors of their offspring, though the father's have the dominant gene and this will influence their final appearance. "This macaw is a second generation hybrid. One parent being the Harlequin (Blue and Gold Macaw & Greenwing Macaw) and the other a Scarlet. They come in a rainbow of colors, sometimes all siblings in a clutch will be a different combination of color. They typically are predominately different shades of red on head & body with etchings of green and blue. Yellows, pinks, & purples can even come into play throughout the wings and tail." A full sized macaw, they can get over 2 lbs. Lengths up to 90 cm (35.5 inches). The Tropicana Macaw typically takes on a composite of traits from its parentage, having a sweet friendly nature, as well as being highly intelligent and curious. They can be a very good natured pet bird, though the Scarlet influence may also introduce a bit of an indomitable spirit. They are a typical macaw. Can be cranky at times and may even be a one person bird or only like men or women unless well socialized. To have a well rounded bird that enjoys more that one person, make sure it is well socialized with lots of folks. Hello i would like to find i breeder for this species in san diego or san bernidino, or likey carlsbad.